Water is not only healthy to drink, but it’s also healthy to exercise in. These health benefits are compounded when an underwater treadmill is used. How does aqua jogging on an underwater treadmill benefit runners over using a land-based treadmill? What Are the Differences Between Regular Jogging and Underwater Treadmill Running? When you compare regular jogging and jogging on an underwater treadmill, you find a number of benefits to aqua jogging. In fact, you get all the same benefits of running on land with the added perks that water provides. When using an underwater treadmill, you can take advantage of buoyancy. By being submerged in water, you reduce your weight up to 90% depending on the water depth. For example, a 150-pound runner underwater has to carry only 15 pounds of body weight. With less weight to carry, you minimize injury risk and undue stress. The force on muscles, ligaments, tendons and bones is also reduced. While regular land jogging can “jar” the body, these foot-striking forces are drastically reduced underwater. Over the long term, there is also less burden on the body. Along with reduced risk of injury, the underwater runner experiences longer runs as well. Aqua jogging on an underwater treadmill also takes advantage of viscosity. Water’s natural drag provides resistance. By pushing against this force of water, you strengthen your muscles — many of which are not used on land. When underwater treadmills are used in addition to on-land training, runners find aqua jogging rejuvenates and strengthens their legs, abdomens and upper bodies. Water features another unique property — it has a hydrostatic effect of increasing thoracic pressure. The result is better cardiovascular conditioning. Circulation is improved and swelling is decreased. The venous return process is also supercharged to clear metabolic waste during exercise. As a result, aqua runners using an underwater treadmill will not experience the muscle soreness as they would on land. During a study performed by Texas A&M University, participants performing Resistance Training Plus Underwater Treadmill (ATM) showed definite benefits over those who completed Resistance Training alone or Resistance Training Plus Land Treadmill (LTM). Not only did the ATM group experience reduced soreness, inflammation and body fat, but they also improved muscle mass and strength performance. They even experienced lower blood pressure readings than the LTM group. For pools that feature a variable-speed underwater treadmill, there are even more benefits. Directional water jets add additional resistance. This resistance engages the upper body and core, and the runner naturally focuses on posture. Not only is muscle strength improved, but so is the intensity of the workout. Studies have demonstrated 50 percent water resistance jet setting is the equivalent of running about one mile per hour faster. A 75 percent setting increases it to two miles per hour faster. With 100 percent jets, the aqua jogging is greater than a ten percent incline on a traditional land-based treadmill. Several studies have been conducted to monitor results provided by HydroWorx pools. One performed by several professionals sought to explore the effects on static balance and “limits of stability” in an aquatic environment. The results were promising, as all participants found a greater center of pressure. A second study uncovered differences in lactate threshold due to the environment, which allowed for less impact and pressure on joints and muscles. The motions mattered the most — and aquatic therapy using an underwater treadmill highlights those motions. Furthermore, another study revealed dramatic changes in metabolic cost comparison between aquatic treadmills with water jets and land treadmills with inclines. What were the results? You guessed it: Runners on aquatic treadmills experienced more metabolic variance than on land. Does That Mean Water Running Burns More Weight Than Land Running? The statistics don’t lie — not only does your facility eradicate any potential for injury caused by the over-impact of limbs, but water running on an underwater treadmill practically forces your clients to use their upper body muscles in motion — muscles they don’t typically need to exert when running on land. After all, moving through air doesn’t exactly provide much resistance. Running in water on an underwater treadmill vs. running on land has been the focal point of many tests. One test concluded that jogging along the track or trail will comfortably burn about eight calories per minute. In comparison, the same level of intensity present in aqua running on an underwater treadmill will burn potentially more than 11 calories each minute. What Kind of Outcomes Will My Clients Experience? 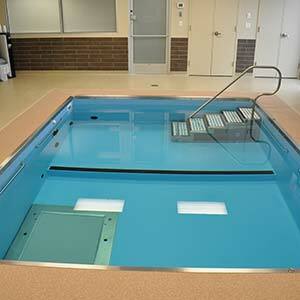 As featured on NBC’s “The Biggest Loser,” a HydroWorx exercise pool can be extremely beneficial to your facility. After all, your clients can lose weight, burn more calories and increase muscle mass quickly. Since they’re only bearing typically 20% of their actual weight in the water, your clients will complete exercises and movements a lot easier — no matter what age they are. There is no doubt incorporating aquatic running workouts on an underwater treadmill is beneficial. By doing so, you optimize fitness while preventing injury. Calorie burns will typically vary from client to client based on overall intensity and duration, which is similar to regular jogging. After all, if a person jogs more than an hour, he or she will be burning more calories than someone jogging for only 20 minutes. Additionally, body weight, level of fitness and metabolism also play roles in determining just how much weight gets melted off. An overweight person might be able to cover more “distance” underwater when held suspended for a longer period of time compared to jogging around the track only to jam joints together painfully. Water running on an underwater treadmill promotes endurance, stamina, longevity and continual recuperation of the body. Your clients can work out more often underwater than on land. They will see better results, faster results and increased satisfaction with results — which can be the game-changer when it comes to losing weight. Should We Recommend Aquatic Running to Athletes? It’s already a given that aquatic jogging promotes recovery from injury, minimizing impact on joints and even muscles. However, it’s not only comparable to typical sports training and weightlifting, but it may competitively be even more beneficial. Studies have been conducted to show the results of aquatic running, monitoring metabolic rates and results. In particular, a Texas A&M University study revealed significant decreases in weight, body fat and BMI. Another significant benefit of pool running is the lean body mass it increases – particularly in the legs and the upper body. It far outpaces that of regular land-based exercises. What athletes end up doing is working the muscles quite consistently with unfailing resistance. Any athlete will tell you that consistent resistance is crucial in developing muscle mass. So what better way to do that than in water? In fact, the more intensity an athlete uses during a workout underwater vs. on land, the better results the athlete will receive – and in a shorter amount of time. The athlete’s generating agents are designed to combat lactic acid as well, allowing muscles to work harder and more efficiently. This means your clients will stay cool, fresh and rejuvenated. Science has also shown that when in warm water, the body releases endorphins designed to appeal to positive emotions about accomplishing goals. When working out underwater on an aqua treadmill, your clients actually feel better about themselves than when working out on land — and they don’t even need to necessarily see results right away. This applies to cross training as well. Cross training emphasizes long periods of consistent activity, persistence, resistance and perseverance. Your clients can train for a longer period of time without over-exerting themselves, risking injury or having to rest for prolonged periods of time. This allows them to maximize cross training to the highest power. Your clients will be able to record large numbers of miles and distances they generally would have trouble completing traditionally on a track. As with any traditional wisdom involving health, wellbeing, exercise and activity, it’s best to diversify the programs at your facility. Your clients could easily focus their entire regimen on water running using an underwater treadmill if they like, but it’s recommended that over 50% of your workout encompasses aquatic running programs, with other supplemental exercises to help build fast results, stamina and endurance. Your clients can rest assured knowing their stamina and endurance will improve with water running using an underwater treadmill. In many cases involving exercise, that’s the starting point. Without stamina and endurance, your clients can easily lose out on strength and power. Like any exercise, it’s important to teach your clients the right way to complete their pool running exercises. Maintaining proper form and gait underwater will produce better results on land. Using an underwater treadmill helps to maintain proper mechanics underwater as opposed to simply walking or running in shallow water. Keep backs straight. Don’t slouch. Maintain a turnover of 180 strides per minute to optimize results. Consistently pump arms, maintaining a 90-degree angle to work the upper body. Don’t overextend legs to minimize actual injury, even under the water. Emphasize a “high cadence,” which forces the body to work harder and faster, in short spurts and repetitions. Utilize an actual pool running belt or vest as well. Water belts only seek to keep your client suspended, but do nothing to maintain their form. These tips are the keys to avoiding underwater injuries. Hamstring strains are often common, although not as severe as what you can face on land from all the impact on your joints. This is why you should teach your clients to avoid overextending – they should always keep a low cadence when jogging underwater. Emphasize the “cyclist” motion to ensure they don’t overextend those legs. It’s easy to go overboard due to the resistance and viscosity of the water. Likewise, your clients won’t receive the full benefit of aquatic running if they’re not using their arms. Runners always use their arms when jogging, practically without thinking. Just because your clients are suspended underwater doesn’t mean they should shortcut themselves on this exercise. Always have them keep their arms moving. Lastly, don’t settle for just any “water belt,” as your client’s form will suffer under the water. One of the biggest challenges aquatic running presents is the fact that you have to adjust to being without the power of gravity. Your clients will be able to move around a lot more fluidly than usual, making it easier to lose their form. A true pool running belt is designed to manage your client’s form and keep it consistent while deep water running. Define client goals. An underwater treadmill can help treat common injuries — including plantar fasciitis, knee pain and ankle sprains. Explain to your client that working on an underwater treadmill will help maintain or improve their level of fitness and rebuild muscle strength, which in turn will speed up the recovery process. Work with your client to develop realistic goals that can bring positive results. Help clients get in the right mindset. For underwater treadmills to duplicate on-land workouts, you’ll need to make adjustments. Explain the differences between working out on land and with an underwater treadmill before they workout. Create the right effort level. To achieve the right effort level with an underwater treadmill workout, both the belt speed and water resistance need to be adjusted. For example, to recreate 12 x 400 meters in 70 seconds, along with a 2-minute recovery, set the belt to 8 mph and the water jet to the max setting. Then, turn off the jets and slow the belt to 4 mph for the recovery period. For beginners, start with deeper water levels. As clients improve, water levels can be reduced to achieve greater exertion levels. Encourage clients to wear the right attire. While regular swimwear is an option for an underwater treadmill workout, clients may have a better experience wearing fitted technical apparel or spandex. Footwear often comes down to client preference. Some individuals prefer the feel of a shoe while others prefer to run barefoot. The professionals at Michael Johnson Performance and the Oregon Project suggest running barefoot underwater to strengthen small muscles in the feet. Good health is all about goals, and there’s no more efficient way to exercise than with aquatic running on an underwater treadmill. Request a free information kit to learn more about how water running on an aquatic treadmill can benefit the clients at your facility. HydroWorx has various financing options to fit your budget. Browse our list of products available and see which one suits your facility and clientele. Try out a pool today and help your clients get refreshed, rejuvenated and revitalized — while achieving their fitness and health goals.